Mainly mountainous and hilly, Abruzzo has three national parks, one regional park, and 38 protected nature reserves, which cover one third of its territory. Therefore, rare species such as the golden eagle, the Abruzzese chamois, the Apennine wolf, and the Marsican brown bear, survive in the area. The Gran Sasso and Monti della Laga National Park covers an area of 2,014 square kilometers (778 sq mi) spread across the provinces of Teramo, L'Aquila, and Pescara. It is centered around the massif of the Gran Sasso, whose highest peak is the Corno Grande, at 2,912 metres (9,554 feet) the highest peak in the Apennines. Just beneath the Corno Grande is the Calderone, Europe’s southernmost glacier. The Gran Sasso rises over the large pastures of Campo Imperatore. Covered by woods of beeches, firs, turkey oaks and chestnuts, the park contains one of the most biologically diverse areas of Europe, with 300 kilometers of trails that can be explored on foot, on horseback or by mountain bike. To the north is the Monti della Laga chain, where thousands of migratory birds can be seen on the shores of Lake Campotosto, a favorite destination for birdwatching. And if the seaside is more of your thing, well, just head to the Adriatic coast, where you will find sandy beaches to the north and pebbly beaches to the south, many boasting the coveted Blue Flag. Abruzzo has been inhabited for a very long time. For those who love ancient Roman history, numerous remains from the Roman civilization are scattered throughout the region, such as Amiternum near L’Aquila, Alba Fucens and Sulmona. The birthplace of the historian Sallust, Amiternum was a traditional settlement of the Sabines before being conquered by the Romans in 293 BC. There are notable remains of a theater and an amphitheater, while a 1st century BC Roman funerary relief depicts the Roman funeral procession, or pompa. Located at the foot of the Monte Velino, Alba Fucens was occupied by a Roman colony in 304 BC for its strategic position. It has some well-preserved fortifications, the forum and an amphitheater. If you love ancient history and archeology, you cannot miss Abruzzo’s most important museum, the Museo Archeologico Nazionale d'Abruzzo in Chieti, where the famous statue Warrior of Capestrano, found in a necropolis from 6th century B.C., is housed. There are also many enchanting historic villages and towns, starting with those found in the Gran Sasso Park, which date to the Middle Ages and have managed to retain their original aspect and atmosphere, such as Castel del Monte and Santo Stefano di Sessanio. Other medieval hill towns located within park areas are Pacentro in the Maiella National Park and Pescasseroli in the Abruzzo National Park. 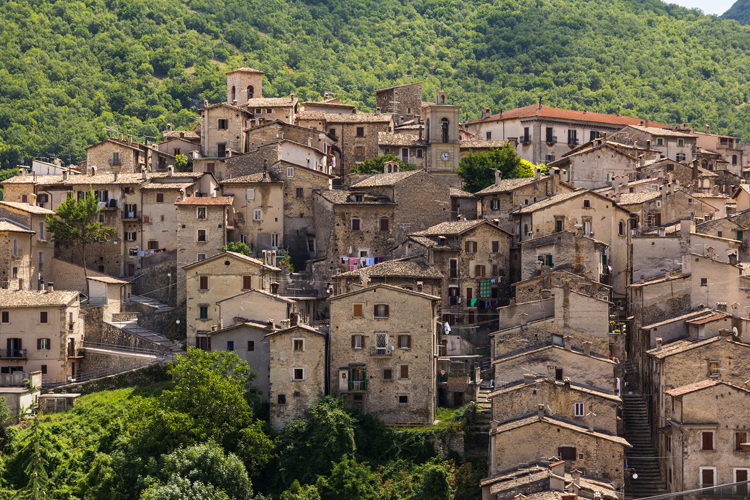 Abruzzo boasts 20 villages belonging to the “Most beautiful borghi in Italy” circuit, second only to Umbria. The greatest and most original period of art output in Abruzzo was the Middle Ages, especially from the 11th to the 14th century, when many cathedrals, churches and abbeys were erected. The classic architecture of the Abruzzese church features a rectangular façade with a straight crowning; the most notable example is the Basilica of Santa Maria di Collemaggio, a masterpiece of Abruzzese Romanesque and Gothic architecture, damaged, unfortunately, during the 2009 earthquake that devastated L’Aquila. Notable cathedrals can be admired in Atri (Cathedral of Santa Maria Assunta), Teramo (Cathedral of Saint Beraldo) and Chieti. The most artistically important town in Abruzzo remains L’Aquila, where you can find treasures such as the Basilica di San Bernardino, the 16th-century castle, the Fontana delle 99 Cannelle, embellished with a stone mask for every spout, and the aforementioned Basilica di Santa Maria di Collemaggio. The rich culinary tradition of Abruzzo will delight visitors who appreciate authentic Italian food. A classic is spaghetti (or maccheroni) alla chitarra, made by pressing or cutting pasta through a chitarra, a machine that forms long thin noodles similar to spaghetti. It is often served with a tomato-based sauce, flavored with peppers, pork, goose, or lamb. Along the coast, many first courses feature seafood, while another traditional primo is scrippelle, thin strips of pasta eaten in soup, typical of Teramo. 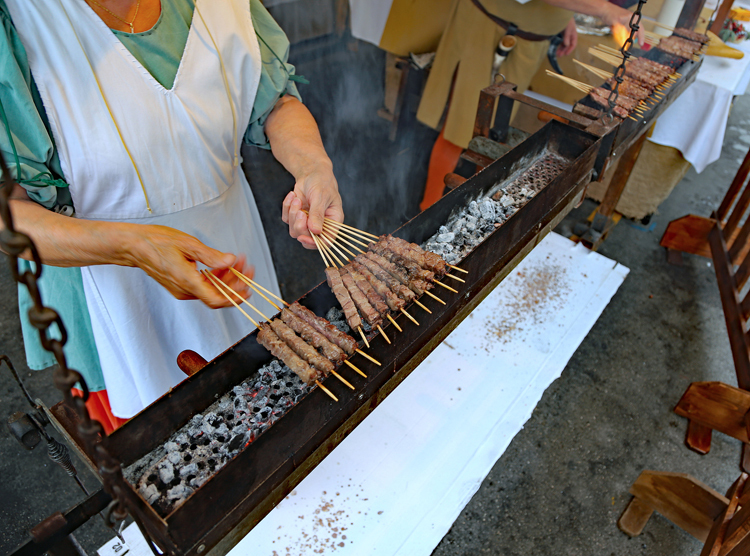 As for second courses, arrosticini, a skewered lamb dish, is Abruzzo’s most famous meat dish; lamb and sheep meats are very popular, and typical dishes include pecora al cotturo, sheep stuffed with a variety of mountain herbs and cooked in a copper pot, lamb cooked whole in a bread oven, and agnello cacio e ovo, a lamb-based fricassee. Scapece, pickled fried fish, hails from Chieti, while guazzetto, fish broth, is popular along the coast. Famous desserts include many preparations similar to nougat, or made with almonds, such as: confetti, sugar-coated almonds from Sulmona; Torrone Nurzia, a chocolate nougat from L'Aquila; and croccante abruzzese, a type of nougat made from almonds and caramelized sugar, often flavored with lemon. 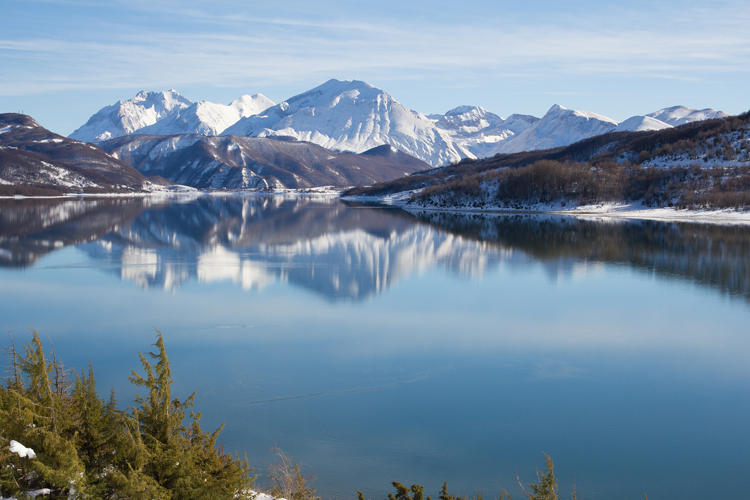 To plan your visit to Abruzzo, visit our Abruzzo-dedicated page.